Franco's Fiesta - Film, fashion, fascism. What's not to like? "William regarded the exit of his wife with equanimity; after seven years of marriage their fights were as legendary as their pay cheques. She was foul mouthed to his scrupulous articulation. He was rugged to her beauty. They were total opposites but conspired to play along with the world’s need for romance." William Roberts and Martha Swift are the ‘two million dollar’ couple. Each film they make nets them a cool million each plus a share of profits. They are the biggest and richest movie stars of the late 60's. Their marriage is in trouble. 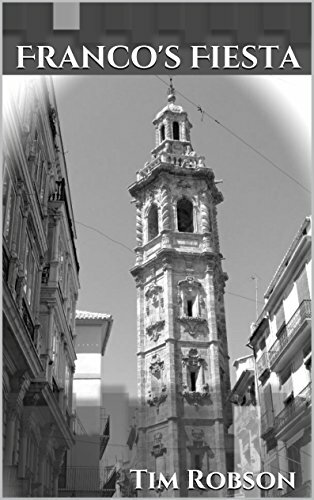 It is the summer of 1970 and William is hired by the Franco regime to make a movie in Spain with a twenty-three-year old model Abigail Sanders as his co-star. Martha is not impressed, even less so when Abigail’s strung out British rock star boyfriend, Jim Clapham, comes to stay. Franco’s Fiesta is told through the eyes of 21 year old Giles Trent, a friend of the family. He watches as William and Martha’s marriage falls apart under the hot Valencian sun. He is unwillingly drawn into this disintegration. Through the lies and manipulation he starts to see the couple for what they really are: William - a drunk with a roving eye, Martha - washed up and insecure at the onset of her fortieth birthday. Franco’s Fiesta is a postcard from a different age. Set in the superficially glamorous world of celebrity it details the loss of innocence at the end of the 60’s. Music, films and fashion are soundtracked against the dying totalitarian regime. Both the Paperback and Kindle versions can be found on Amazon. Click below. Usually very cheap. Got a royalties cheque this week. Bring on the dancing girls and champagne! Both the paperback and Kindle edition can be found on Amazon cheaply. Click below.